Staff must wear security supplies similar to harnesses, head gear, mitts, and at times masks as they are sanding as it generates considerable quantities of airborne debris. first-class when it is polished plus painted correctly. Hiring a qualified drywall contractor in Portland Oregon is key to the success of your next Drywall Portland project. Drywall panels cover a great deal of walls and ceilings created during the last 40 yrs..
Drywall construction started to be prevalent as a quicker choice to having to use plaster dependent interior finish approaches, which involved vigorously distributing a substrate of coarse plaster, called the bottom (made of the scratch coat and(optional) brown coat), onto the wall’s lath-work before completely applying the smoother finish coat, every layer added in succession and all by hand. 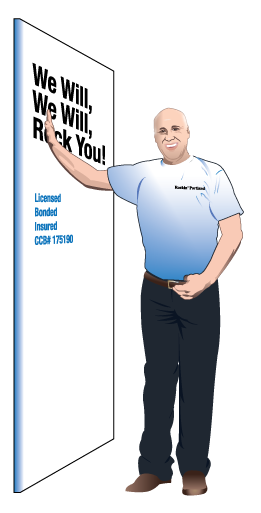 A Drywall Contractor in Portland Welcomes You! Our highly trained installers are professional, courteous and trained in the latest industry techniques for drywall. We love to work directly with individuals and with builders throughout the Portland Metro and Vancouver area. No job is too small or too big. Each gets our expertise and commitment to quality for a very competitive price. We offer free estimates, speedy service and affordable excellence. Here is just a brief list of our dry wall services! What Can We Rock For You? Need help with a drywall project? We'll provide a FREE upfront estimate and you can experience our slogan first hand - "We bid 'em to get 'em!"